I have been an Amazon Prime member for 3 years now, and to be honest, I've enjoyed their program except with my recent experience with them. For those new to the program, the cost of being a Prime member was $79 ($85.50 plus taxes) annually prior the year 2015 (now $99 plus taxes is $107.14), where you get unlimited movie and TV streaming, "subscribe and save" features that can save you more money (extra discount) on recurrent purchases, great deals during holidays especially the Christmas season, one free borrowed e-book every month, and their popular two-day shipping on almost everything you buy within their website. The Amazon Prime membership was great that's why I bought an advance $79 membership when a lot of the deal sites online informed new and old subscribers that it will increase it the following year to $99. So I ordered one membership but I can't use it yet nor be added to my present membership because it can only be used once my paid membership will expire. 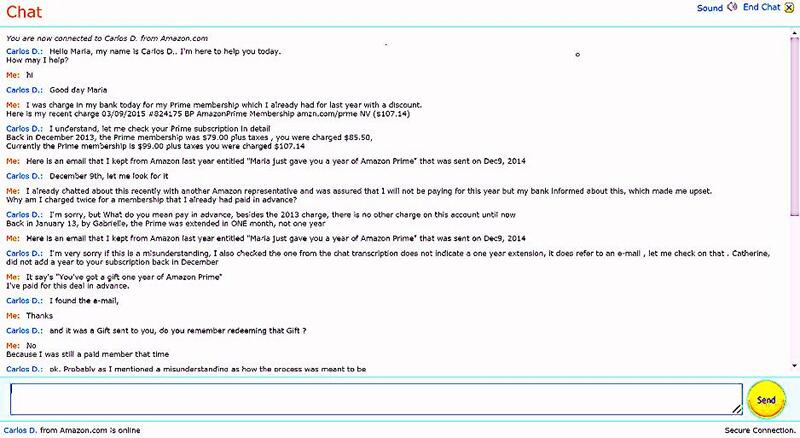 After I paid for this advance membership, I received an email from Amazon with the subject "Maria just gave you a year of Amazon Prime" and I was glad that I saved it on my email's folder because I was able to use it as proof on claiming my advance paid Prime membership. So a month before my Amazon Prime membership will expire, I contacted an Amazon representative and was told not to worry because I will not be paying anything because my advance membership payment will automatically continue on the day that it will end, but to my surprise, this never happened. 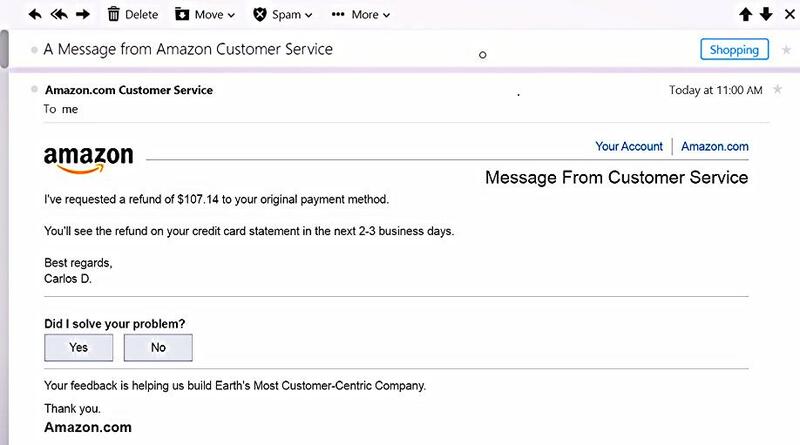 I was glad that my bank associated with my Amazon account has an email transaction alert that every time there is any withdrawal from my account, they will automatically inform me. Even if I did not place a Preferred Payment Method in my account which means (No payment method is linked to my Prime account) they still charged me. 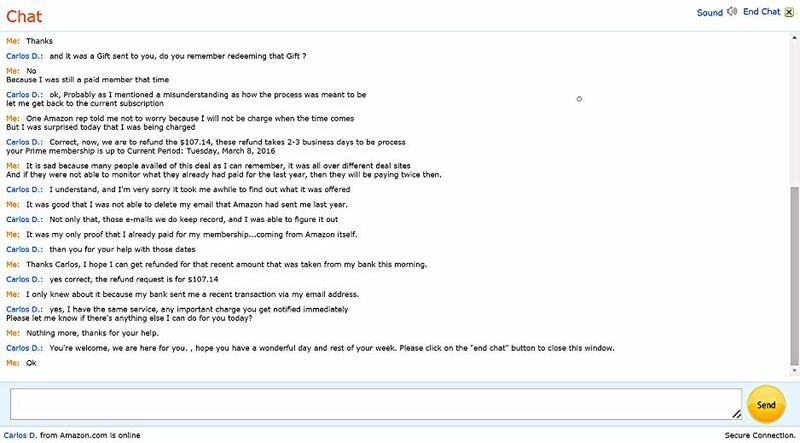 I was surprised on March 9, 2015 that a withdrawal transaction in the amount of $107.14 has occurred on my account and I immediately contacted Amazon about it. Below was a chat communication from one of their representatives. I was glad that I received the refund the following day and my Prime membership will be extended up until March 8, 2016. But sometimes, I wonder if I may renew it after that. I did a lot of thinking but I found out that I buy a lot of things online, especially during the holidays, and the two-day shipping is great as a Prime member. Possibly next year, I can make it affordable if I can have up to four household members (including extended family members even not living at the same residence or address) pay a little in order to contribute on this prime membership. I had not done this before but I'm thinking that if I split the costs with others and let them pay as little as $20 per year, it will really add to the benefits and in this way, I can enjoy more shopping online every year. Since we are expecting another baby, one important reason for continuing my Prime membership is the Mom Subscribe and Save feature from Amazon Prime. With my membership, I can avail and access the 20% off recurring deliveries on diapers through Subscribe & Save and Prime Pantry, as well as a 15% Baby Registry completion discount and access to their many exclusive discounts and deals. This is good since these offers are exclusively provided by Amazon Mom, a free program for Prime members. With their Amazon Baby Registry, I will be able to avail Earth's largest selection from any of my tablet, PC or mobile device, the ability to add anything to my Amazon Baby Registry from any website, and the 90-day returns on most items bought on Amazon. It is truly stress-free to get diapers, wipes and a lot of baby products shipped quickly and free when you have kids to take care of. It can save you time and effort waiting in line to pay for these things, carrying, loading and unloading inside of the car for all those heavy stuff outside from the store with a small child and a newborn. Online shopping is truly convenient plus it saves gas money going back and forth. Another thing that I liked about my Amazon Prime membership is their Kindle FreeTime. This is a great way for parents to turn those Kindle Fire HD tablets into safe entertainment gadgets for their kids at home. Ever since we had availed of this service, we no longer worry about our child meeting strangers online and exploring too much of the Internet from her tablet. And for only $2.99 each month per child, or $6.99 a month for a family with up to 4 kids (for Prime members), Kindle FreeTime Unlimited is an all-in-one subscription for children that offers them age-appropriate and unlimited content kid-friendly books, movies and TV episode streaming, games to play, educational apps and more especially from their favorite Disney, Sesame Street, Nickelodeon, PBS, Electronic Arts, etc. Amazon FreeTime Unlimited allows children to explore a world on their own. As parents, I don't have to spend time and money trying to guess what my daughter will enjoy. The one that I highly appreciated is the fact that there are no ads, and no in-app purchases and extra charges with this program. They have an amazing content for children to explore within a kid-safe place. It truly promotes reading and math with their educational apps and so many books. The thing I like about it is the parental controls plus I can personalize my kid's experience with her profile. I can also let her watch where she want to on any of her Kindle Fire tablets or even the Fire TV. She is a home schooled child and enjoys reading a lot that is why it's not easy for me give up my Prime membership due to the benefits and discounts that I and my family can avail from it unless there is a good competitor any time soon. As Prime subscribers, we are also enjoying their latest offering which is the ad-free streaming music library with a user-friendly interface plus "over a million songs and hundreds of playlists" to choose from. Indeed, their library is an added perk for being a Prime account holder. I can easily listen to individual songs and albums too. If you're not a member yet, you can try Amazon Prime Membership FREE 30-day Trial or if you're a college student you can try the Amazon Student 6-Month FREE Trial, and always keep track of when your subscription will end as well as how you can use every benefit that they are offering. You can’t know unless you try it and don't worry because it's easy to cancel the subscription if you don't like it. You can also avail of their Amazon.com Rewards Visa Card in order to receive free money from the purchases that you had made. This free money will accumulate as Amazon points that you will later use to purchase anything from their website.